20m to the left of Cosa Nostra, on the other side of the path, on the boulder next to the former orange n°18. Sitstart as for Rasta, traverse the low ledge, climb the right arete and exit on the top of the boulder with that one as for Freak of the Weak. Un nouveau nom, une voie revendiquée ouverte par..., pour un ou deux mouvs de plus en 5c face à la suite en 7c+ (ce qui fait 8a/7c+). Ces exemples "d'ouvertures" sont de plus en plus fréquents sur ce site. - Est-ce bien "sport" tout ça ? Pour clariffier ce n'est pas deux movements du tout, c'est 6 mouvements en plus coté 7a/+, juste comme pour basta et rasta..
pour une ligne majeure de 5 etoiles. Avant de faire des commentaire ridicules, avez vous essayer ou meme grimper ce bloc magnifique n'importe la cote? "Sport (or sports) is all forms of usually competitive physical activity which, through casual or organised participation, aim to use, maintain or improve physical ability and skills while providing entertainment to participants, and in some cases, spectators. Hundreds of sports exist, from those requiring only two participants, through to those with hundreds of simultaneous participants, either in teams or competing as individuals." 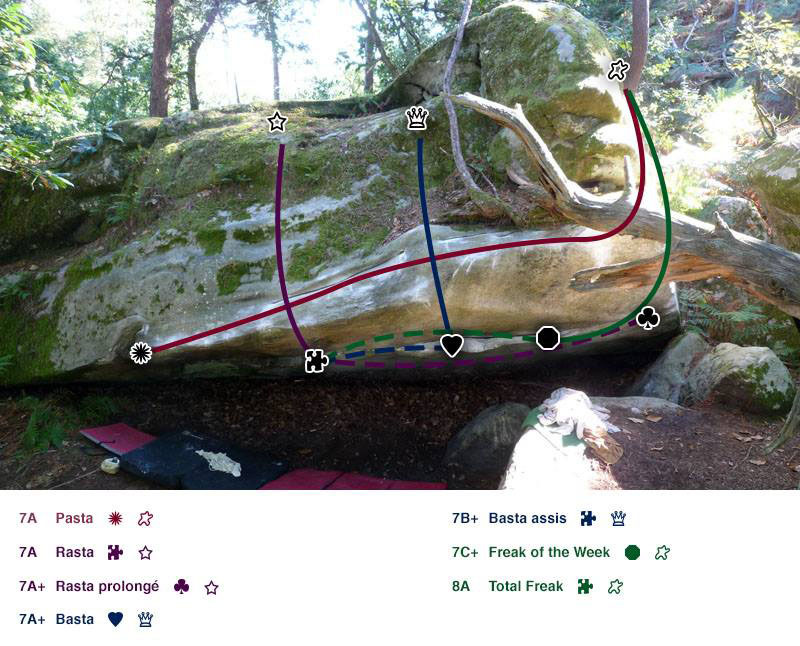 Nice job Jan, The moves makes the total boulder a bit harder, and it is a very logical line. I`d say, skip the nonsense comments here. I think you did a nice job acending the whole line!